A recent study by Transparency Market Research (TMR) suggests that global mass spectrometer market is relatively consolidated between three players who collectively owned 49% of the shares in 2015. The three leading companies were Shimadzu Corporation, Thermo Fisher Scientific, Inc., and Agilent Technologies. The other half of the market is quite fragmented though, owing to the presence of a large number of small regional and global vendors. Several strategic mergers and alliances are expected in the near future. This factor, along with advances in technology, is expected to intensify the competition among the other fragmented half. As far as the leaders of the market are concerned, they rely on research and development activities and acquisition of smaller vendors to gain ground over the other two. The TMR report also observes that availability of refurbished mass spectrometer is containing the production of new equipment, a factor that is more applicable in emerging economies wherein the cost of new mass spectrometer equipment can be a major hindrance to the prosperity of the market. 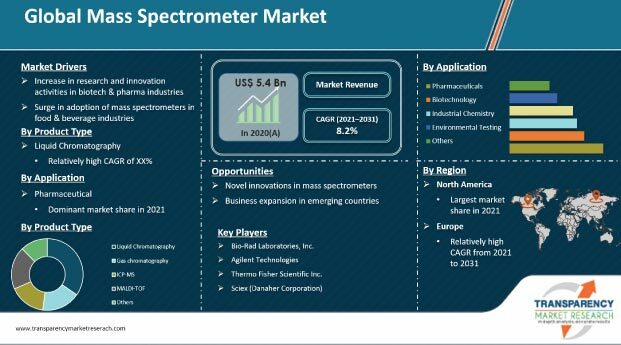 As per the evaluations of the report, the global market for mass spectrometer was worth US$5.35 bn in 2016, and estimates it to expand at a healthy CAGR of 8.1% during the forecast period of 2016 to 2024 to reach a valuation of US$9.99 bn by 2024. Product-wise, the report segments the global mass spectrometer market into liquid chromatography-mass spectrometer (LC-MS), gas chromatography-mass spectrometer (GC-MS), matrix associated laser desorption or ionization-time of flight (MALDI-TOF), and inductively coupled plasma-mass spectrometer (ICP-MS). Among these, MALDI-TOF equipment segment accounted for 30% of the demand in 2015 and is expected to remain most profitable throughout for forecast period. This sustained demand can be attributed to the growing popularity of advanced instruments by several prominent companies including Shimadzu Corporation, Waters Corporation, and Thermo Fisher Scientific. The report also expects the recent launch of new instruments such as Waters Corporation’s Vion IMS QTOF Mass Spectrometer have a fruitful effect on the mass spectrometer market. Application-wise, the global mass spectrometer market is categorized into biotechnology industry, pharmaceutical industry, industrial chemistry, food and beverage industry, and environmental testing. The food and beverage industry is touching new peaks these days, and consequently the demand for product quality testing via mass spectrometer is escalating. However, the industries of pharmaceuticals and biotechnology remain the most profitable for the vendors in mass spectrometer market, accounting for 55% of the demand in 2015. Geographically, North America continues to serve the maximum demand for mass spectrometer, followed by Europe. On the other hand, Asia Pacific and Latin America are also anticipated to turn into lucrative regional markets due to the growing demand for better quality analysis tools and scope of applications in other sectors including mining. Apart from the prosperity of pharmaceutical and other industrial sectors, growing requirement of mass spectrometer for environment testing is expected to escalate the demand in the near future. In addition to that, the emergence of metabolomics is also expected to favor the growth rate of the market. Highly useful metabolomics are hard to research in comparison to proteomics, and mass spectrometer is essential to analyze the structural characteristics of biomolecules. On the other hand, heavy investment required for research and development and high cost of the equipment are some of the factors hindering the growth rate of the global mass spectrometer market. From the competitive perspective, the market is expected to gain traction from several mergers and acquisitions that have been finalized in the past decade.